Serendipity: The faculty of making fortunate discoveries by accident. Don’t you just love when that occurs? Bear with me while I tell you what happened. I was at the bookstore, looking for some captivating history and discovered this book “Saxons, Vikings, and Celts” by Bryan Sykes. This sounded intriguing, so I bought it. It sat on the bookshelf at home until one day I had finished what I was reading and looking for my next book when it caught my eye. What a nice surprise this book was. Bryan Sykes is the Chairman and Professor of Human Genetics at Oxford University in England and since April 2000 has been using his laboratory to explore the genetic roots of British peoples and others around the world. He had discovered DNA could be categorized into seven basic groups. And these seven groups he hypothesized to be from seven ancestral women. He called these women the “Seven Daughters of Eve”. He even named these clan mothers Helena, Tara, Jasmine, Xenia, Velda, Katherine and Ursula. He found that 95% of Europeans could be traced back to these ancient clan mothers and determined by mutations in the DNA these women lived anywhere from 45,000 to 17,000 years ago. In tracking the clan mother’s DNA, he determined the ancestors of the Irish came from the Iberian Peninsula which piqued my interest. He explained there were Christian monks in Ireland who wanted to weave together the pagan mythologies with Christianity to convince the natives to become worshipers of Christ. The monks wrote a chronicle called the “Leabhar Gabhala” which mapped out the migration patterns of the ancestors of the Gaels in Ireland. According to the “Leabhar Gabhala”, these ancestors were the sons of Mils, who was also known as Mile Easpain or the “Soldier of Spain”. Mils was a direct descendant of Fennius Farsa, a Scythian King who lost his throne and fled to Egypt. Mils made his way to Spain and his nephew had gone to Ireland but was killed by the prior tribal masters of Ireland. 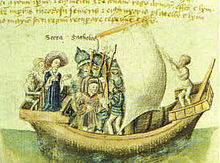 Mils went to Ireland with his wife Scota and his three sons to avenge his nephew’s death. Mils and Scota were killed while there but their sons survived and ended up ruling Ireland. The Gaels considered Scota to be their ancestral mother and called themselves Scots after her. The legend says Scota was a “daughter of the Pharaoh”. This explains how she could have met Mils, become his wife, moved to Spain and ended up in Ireland. Her Gaelic descendants crossed the Irish Sea over to Scotland and settled there. And so you have the start of Scottish civilization. Now, in doing some reading in another book on a medieval Scottish queen, the author, Henry Grey Graham mentioned Scota and how she came from Egypt, bringing with her a stone called “Lia Fail” or “The Stone of Destiny”. 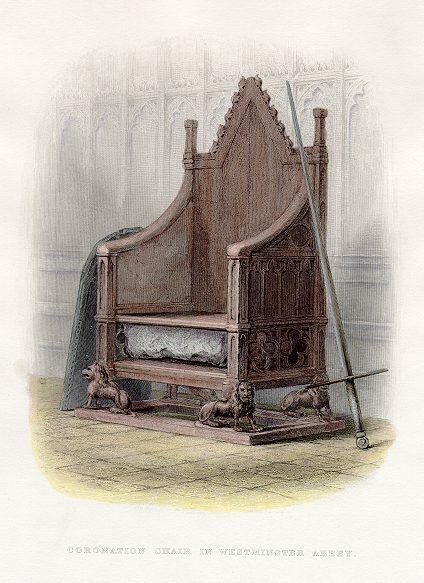 Part of the coronation rite of the Kings of England includes the monarch sitting on the Coronation Chair which has a small opening underneath the seat that holds the Stone of Scone, signifying that the monarch rules Scotland as well as England. Graham said the Stone of Scone was “Lia Fail”, the stone Scota brought with her from Egypt. I found that to be fascinating! The Scottish peoples were descendants of an Egyptian princess and they have the stone she brought with her as evidence! Of course, the Stone of Scone is shrouded in mystery, legend and mythology. It wasn’t really linked to Scota until the early 14th Century in order to increase the significance of the Scottish people’s history. But what an enchanting serendipitous tale it is. The overriding factor in the whole legend is that a woman founded the Scottish people. That cannot be denied. We have the DNA to prove it. The Irish – more Spanish than Celtic? Fantastic history, Susan! I was aware of the ‘Scota’ story but not the details of it. It has always fascinated me too. Wouldn’t it be wonderful if that’s where the ‘Scot’ name came from? I like Brian Sykes and have a couple of his books – really interesting research. I love this! History and science to back it up 🙂 I’ve saw a documentary done by the BBC that talked about something similar. I’ll have to look for it. It was about the ancient history of Scotland and they traced the hosts DNA. I bet I just missed the part about Scota. I’ll see if I can find the video. Great post. Excellently written!